Raced out this morning, between bouts of rain, to a spot passed on yesterday’s photowalk. 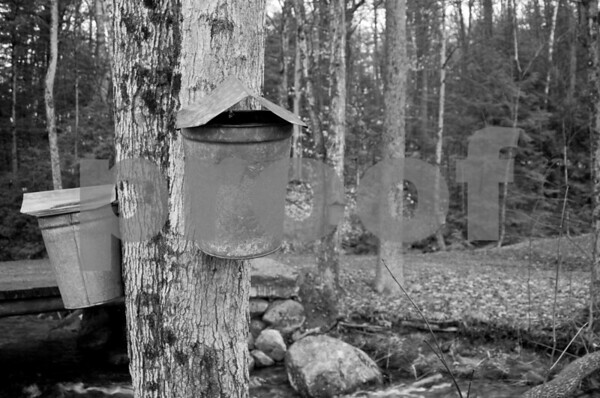 I couldn’t resist a standard New England scene; the sap bucket. It was pretty dark in the woods and I didn’t bring my tripod or fast glass, so please forgive the fact that it isn’t tack sharp – it was hand held at 1/25th, even after ISO was boosted to 800. Lovely comp and definitely works well in b&w! I really like this. I think the fact that it isn't sharp makes it more interesting. The BW treatment adds to it.